Many have expressed concern over our future as a nation. Will we fall due to moral decay, or will we continue to receive God's blessings and favor? How can we turn our nation around? 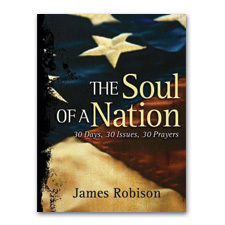 James Robison offers a solution: Return to God through prayer and action. In The Soul of a Nation, he offers 30 days of directed prayer for our future and our children's futures. He gives reflections on current events and a prayer for God's will to be done. The Soul of a Nation is a guide for life-changing prayer. The collective prayers of Christians who match their words with actions have the power to turn this nation around.